You probably know by now that I have an Etsy shop. Last November it was slowly becoming clear I was going to have a pretty busy holiday season. Through the rest of the year, most days had looked about like this. By November, more days were looking like this. The problem was, I needed something to carry the mail to the post office in. I didn’t want a big bag, because on those slower days I’d lose the envelopes in it, but some days I needed the extra room. I decided what I needed was a bag that could be adjusted to meet my needs on any given day. Turns out, it’s pretty handy for shopping trips too! To make this bag, you’ll need to choose a fabric for the outside, and another for the inside and pocket. And one 1/2 to 1” button. We’ll start by making the outside front pocket. Lay piece D and H right sides together. Stitch both 12 1/2” edges with a 1/4” seam (all seams throughout the pattern are 1/4”, unless otherwise noted). Turn and press. Fold in half with the seams touching and the side you want to be the outside of the pocket to the outside (I used the lining). Press the fold. Open the pocket back out. Place the back of the pocket on the front of piece A, 4” from the upper edge. Stitch the pocket 1/8” from the top edge. Stitch the 4” soft side of the Velcro onto piece A, centered side to side and 3” from the top edge. If your fabric is very lightweight, you may want to iron a small piece of interfacing onto the back before sewing the Velcro to add stability. Fold pocket up and pin in place. To make the Velcro tabs, fold piece E the long way and press the fold. Open and turn both edges inside to the fold. Press. Fold one end 1/4” to the inside. Press. Flip over. Sew the hard side of the 2” piece of Velcro 1/4” from the short, turned under end and centered between the center fold and the left edge. 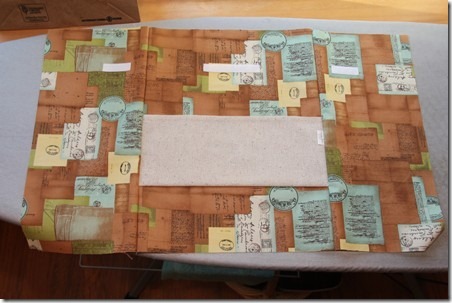 Repeat all steps with remaining piece E, centering the Velcro between the center fold and right edge. Fold at the center fold with the Velcro to the outside. Stitch across the short end near the Velcro and down the long edge. Stitch the soft side of the 2” Velcro to piece B, 3” from the upper edge and 1 1/2” from the right side. Repeat with remaining piece B, with Velcro 3” from the upper edge and 1 1/2” from the left side. Stitch pieces B to front A (with the pocket), right sides together with Velcro on B closest to the front. Lay out remaining piece A, right side up. Place Velcro tabs, Velcro up, with top edge of Velcro 3” from the top edge of A. Either pin with the pins sticking out the sides so they can be easily removing while stitching or baste in place. Lay front and sides that you already stitched together (A and B) on top. Match remaining B edges with back A edges. Stitch, backstitching over tabs for strength. Press seams to one side. Flatten the bag with the front centered and side seams matching. Stitch the bottom edge. Press folds into sides (in center of side panel B). Open out side panel, flattening corner at bottom. 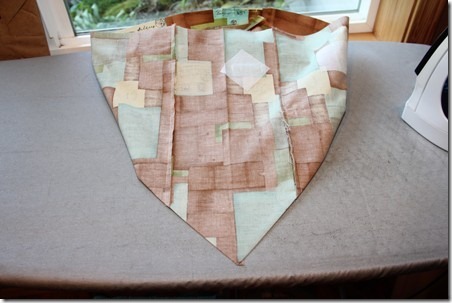 Keep center fold and seam underneath even with each other. Press corner flat. Turn over and stitch horizontally across the corner along stitching line. Repeat on opposite corner. To make lining, repeat steps above using pieces F, G and H, beginning with ***** and ignoring Velcro, pocket and tabs. To make handles, fold piece C in half the long way, press, then open and fold edges into center. Fold in half again. Press. Stitch 1/8” from the long edge. Turn back right side out. Pin or baste straps in place to front (A), extending 1” beyond upper edge and 2” from seam on each side. Repeat on back (A). Lining should still be inside out. Stuff bag inside so bag and lining are right sides together. Match the upper edge and seams. Pin and stitch around upper edge, leaving a 4” opening on one side for turning. Turn bag and lining through opening. Push lining into the bag. Press the edge, turning in the edge of the opening. Topstitch all the way around top edge. Box stitch at base of handles by sewing a square with an X through it. Press bottom of bag flat like a grocery sack, making sure lining is pushed all the way in. Stitch 1/8” from the edge across the front and the back. Lay bag flat, front up. Flip out Velcro tabs. Fold bag up and press well. For ease of folding, turning back inside out. Pinch each fold of lining and outside and stitch 1/8” from fold. Stitch soft side of 2” Velcro to bottom of bag, centered and near front edge. Fold up bottom and push underneath pocket. Use pins to mark the corners of the Velcro on the bottom piece. Pull pocket up and mark with pencil. Stitch hard side of Velcro to underside of pocket at marks. Make a button hole to fit your button in the center of the outside pocket and 3/4” from the top edge. Sew button behind it onto the bag. Your bag is finished! To fold it up for use with smaller items, lay flat on it’s back. Fold up the bottom and slip it under the pocket, making sure the Velcro attaches. 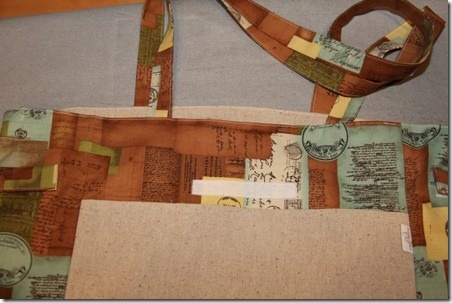 Flip the tabs across the front, attaching to the center Velcro on the front of the bag. 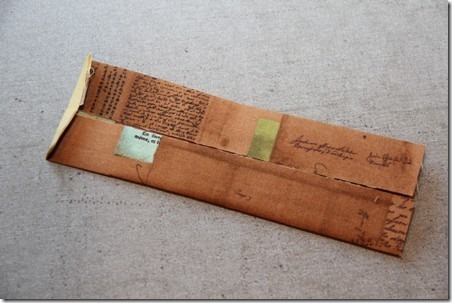 Perfect for a few smaller letters or envelopes. For larger packages, pull out bottom and remove Velcro tabs from front and stick to sides. The front pocket is great for carrying customs forms. I’d love to embroider my logo on the front pocket. Maybe one of these days when the mail bag isn’t so full I’ll have time to tackle that project!